Mycobacterium avium subspecies paratuberculosis (M. paratuberculosis) is a facultative intracellular pathogen that resides within host macrophages during infection of ruminant animals. We examined survival of M. paratuberculosis infections within cultured macrophages to better understand the interplay between bacterium and host. Serial plating of M. paratuberculosis infected macrophage lysates on Herold's egg yolk medium showed that mycobacterial replication takes place between 0 and 24 hours post-infection. This initial growth phase was followed by a steady decline in viability over the next six days. Antibodies against M. paratuberculosis were affinity purified and used in conjunction with transmission electron microscopy to track the development of intracellular bacilli. Immunogold labeling of infected macrophages with antibody against M. paratuberculosis showed degraded intracellular mycobacteria that were unrecognizable by morphology alone. Conversely, when macrophages were heavily infected with M. paratuberculosis, no degraded forms were observed and macrophages were killed. We present a general description of M. paratuberculosis survival within cultured macrophages using transmission electron microscopy and viability counts. The results of this study provides further insight surrounding M. paratuberculosis-macrophage infections and have implications in the pathogenesis of M. paratuberculosis, a pathogen known to persist inside cattle for many years. Johne's disease, also called paratuberculosis, is a chronic granulomatous enteritis of ruminant animals caused by Mycobacterium avium subspecies paratuberculosis (M. paratuberculosis). While Johne's disease can end in death of the animal, the economic impact of this disease is much more significant [1, 2]. Losses are estimated to be $200/clinically infected cow/year and are a result of animal culling, reduced milk production, poor reproductive performance, and reduced carcass value [1, 3]. Research on the pathogenesis and immunology of M. paratuberculosis infections of cattle is necessary to allow design of more rational diagnostic and control procedures. A small number of specialized microorganisms can survive inside macrophages designed specifically to kill bacteria. However, a hallmark of mycobacterial pathogenesis is their ability to survive, and even replicate, within macrophages. These include Mycobacteria, Salmonella, Listeria, Coxiella and Corynebacteria. Different mechanisms are employed as survival strategies and the mycobacteria are exceptional in the duration and persistence of this interaction. Survival of pathogenic mycobacteria is attributed to the fact that the mycobacterial phagosome does not fuse with lysosomes [4–6]. The mechanism that prevents phagosome maturation is still unknown as are any mycobacterial genes that contribute to the delayed maturation. Several studies surrounding the interactions of M. paratuberculosis with macrophages have been published because of its importance in pathogenesis. These studies include entry into J774 macrophages [7, 8], an electron microscopic examination of goat tissue [9, 10] and an assessment of intracellular fate of M. paratuberculosis within bovine monocytes/macrophages [11, 12]. However, many assumptions regarding M. paratuberculosis interactions with macrophages are based on analogies to M. tuberculosis or M. avium. In this communication, we present an analysis of M. paratuberculosis survival within J774 macrophages using transmission electron microscopy to show temporal events early during infection. The growth of M. paratuberculosis was measured at early stages during infection of non-activated macrophages. Growth was measured by bacterial cell counts following serial dilutions on HEYM slants. The cell counts from three independent experiments showed a slow decline in M. paratuberculosis viability over 7 days (Fig. 1). After infection, an initial growth phase occurred until 24 hours postinfection where mycobacterial counts began to decline. In two of the three experiments, an increase in bacterial counts occurred after 70 hours postinfection up until 95 hours where a second decline in viable mycobacteria occurred. These data suggest that while M. paratuberculosis survives much longer in macrophages than some pathogens [15, 16] including other species of mycobacteria , there remains a significant decrease in viability over time. Growth and survival of M. paratuberculosis in murine macrophages. Resting J774 macrophages were infected with M. paratuberculosis at time zero. Infected lysates were harvested and plated in triplicate on HEYM slants at 0, 24, 48, 72, 96, 120, 144, and 168 hours postinfection. The results from three independent experiments are shown. All platings were performed in triplicate. Error bars denote standard deviation. Because the viability of M. paratuberculosis decreased with time, it was of interest to examine the progression of M. paratuberculosis infection by immunoelectron microscopy. However, a reliable method to label intracellular mycobacteria needed to be developed first. Therefore rabbit antibodies against a whole cell sonicated lysate of M. paratuberculosis were affinity purified. These purified antibodies labeled the outer periphery of Middlebrook 7H9 cultured M. paratuberculosis (Fig. 2C). This purified antibody preparation was then used to label M. paratuberculosis within infected macrophages (Fig. 2A and 2B). The purified antibody was highly specific as all gold particles are associated with the mycobacteria and no labeling of the surrounding background or macrophages was observed. Control preparations of uninfected macrophages failed to label with antibody against M. paratuberculosis (data not shown). Note the mycobacterial morphology remained constant when comparing intracellular with extracellular bacilli (compare Fig 2B with Fig 2C). Immunogold labeling of intracellular and extracellular M. paratuberculosis. A single macrophage is shown at 48-h postinfection (A). (B) An enlargement of the boxed region in panel A showing immunogold labeling of intracellular M. paratuberculosis. (C) Preparation of M. paratuberculosis cultured in Middlebrook 7H9 medium. Gold particle labeling was seen predominantly at the periphery of the mycobacterial cells. Magnification: 11,180 × (A); 104,000 × (B); 88,400 × (C). Macrophages were infected with M. paratuberculosis at a 5:1 ratio and fixed in glutaraldehyde at various time points to examine the development of mycobacteria in this environment (Fig. 3). Vacuoles harboring mycobacteria appeared tightly arranged and not spacious as previously observed in Coxiella burnetii containing vacuoles [18, 19]. The mycobacteria themselves were in very close contact with each other. The size, number, and morphology of the mycobacteria appeared to remain relatively constant throughout the observed time period. At all times postinfection, mycobacteria were mostly found as groups inside vacoules. Occasionally, single bacilli were observed within a tight vacuole. An increase in the percentage of degraded mycobacteria was observed with time. There were two degraded bacilli per 25 fields at 24 hour postinfection and 12 degraded bacilli per 13 fields at 72 hours postinfection. Similar data were obtained in two independent experiments. Degraded mycobacteria were morphologically unrecognizable, but did label with immunogold, indicating the presence of M. paratuberculosis antigen (Fig. 4). These data indicate that macrophages can kill and degrade a percentage of mycobacterial cells in a given infection. Transmission electron micrographs of M. paratuberculosis-containing vacuoles in J774 macrophages. 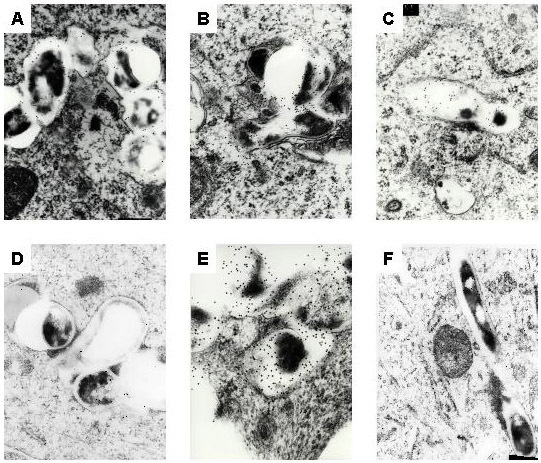 Infected macrophages were processed for transmission electron microscopy at 24 (A), 48 (B), 72 (C), and 96 (D) hours postinfection. The left column shows the infected macrophage and the right column shows an enlargement of the mycobacterial vacuole. Image magnification is shown beneath each column. Arrows point to the same mycobacterial cell in each magnification. Some mycobacteria are degraded within macrophages. 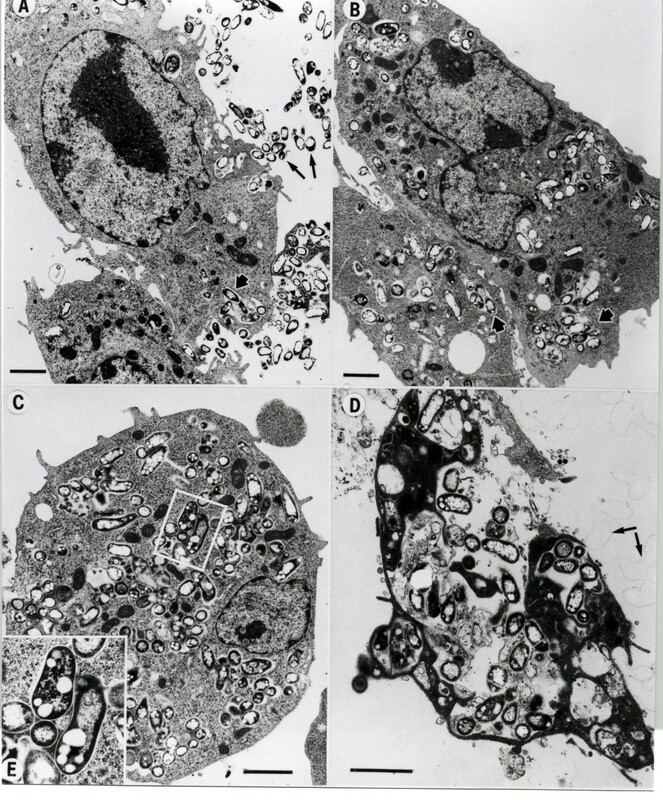 Infected macrophages were processed for transmission electron microscopy at 24 (A), 48 (B), 72 (C), 96 (D), and 120 (E) hours postinfection. Degraded, unrecognizable mycobacteria were labeled with immunogold particles (A-E). Healthy M. paratuberculosis bacilli at 72 hours postinfection were seen in (F). Magnification: 104,000 × (A-C), 104,000 × (D), 165,000 × (E), 88,400 × (F). We next examined the outcome of mycobacteria within heavily infected macrophages. J774 macrophages were infected with M. paratuberculosis at high multiplicities of infection (30:1) and examined at various times post-infection (fig. 5). Extracellular mycobacteria were phagocytosed via actin rearrangement and remain within phagosomal vacuoles dispersed throughout the cytoplasm (fig. 5A and 5B). At least 20 infected macrophages were examined at each time point. Note the electron transparent lipid vesicles present within M. paratuberculosis. These electron transparent vesicles were seen at all time points examined. At 48 hr postinfection (fig. 5C), the cytoplasm of the macrophage is loaded with mycobacterial-containing vacuoles. By 72 hr postinfection, the macrophage cytoplasm is dark and the cell appears necrotic, possibly due to the heavy mycobacterial load or apoptosis. Severe membrane sloughing or blebbing seen to the right of the macrophage and identified by the arrows in Fig. 5D is a sign of apoptosis [20–22]. No degraded mycobacteria were observed in these experiments. Therefore, at high levels of infection, it appears that mycobacteria survive while the host macrophage is killed. Whereas the outcome is reversed at lower moi. Heavy M. paratuberculosis infection of J774 macrophages. Macrophages were infected at a 30:1 ratio and processed for transmission electron microscopy at 0 (A), 24 (B), 48 (C), and 72 (D) hours. Long arrows in A identify extracellular M. paratuberculosis whereas short arrows in A and B show intracellular M. paratuberculosis within vacuoles, presumably phagosomes. Membrane protrusions indicative of actin rearrangements involving phagocytosis can be seen in the top center of panel A. The inset (E) shows the intracellular detail of selected bacilli. Arrows in (D) identify membrane blebs. Scale bars = 1 μm. Growth and survival of mycobacterial species within macrophages has been an area of intensive study because of its implications in pathogenicity. For example, M. bovis has been shown to grow within macrophages whereas BCG strains do not . This observation is controversial since there are reports of immunocompromised patients with disseminated BCG. Although multi-species studies are complex and multi-factorial, M. avium appears to be able to survive in secondary lysosomes better than does M. tuberculosis. In macrophages co-infected with Coxiella burnetii, an intracellular pathogen known to inhabit and replicate within secondary lysosomes , M. avium growth was not impaired . Whereas M. tuberculosis bacilli that co-localized with C. burnetii containing vacuoles, did show reduced growth . A recent report by Thomsen et al. showed a higher percentage of degraded M. paratuberculosis in euthymic as compared to athymic mice. The in vivo study by Thomsen supports data from our in vitro study, indicating that J774 cultured macrophages are a good model for pathogenesis studies. Many bacteria such as Staphylococcus aureus are rapidly endocytosed and digested by macrophages within a few hours postinfection . The present study showed an initial 25 hour intracellular growth period of M. paratuberculosis followed by a slow decline in the viability within macrophages over a period of 7 days. This survival curve is similar to that observed by Zhao et al. which showed M. paratuberculosis intracellular growth in the first six days followed by killing after day six. The experiments described herein were performed using the type strain of M. paratuberculosis, which may have affected the survivability within macrophages since it is not a recent field isolate. However, M. paratuberculosis 6783  and M. paratuberculosis BO45  are field isolates that have both showed a decline in viability inside macrophages over time, although much slower than observed with the type strain. No attempt has been made to activate the macrophages in this study, although several laboratories have shown that macrophages activated with cytokines such as interferon-γ increase the ability to kill mycobacteria [26–30]. A very recent communication of M. paratuberculosis interactions with macrophages was published during the course of our experiments . This comprehensive study showed that M. paratuberculosis-containing vacuoles were mildly acidified (pH 6.3) as compared to latex beads (pH 5.2). In addition, the M. paratuberculosis phagosome was characterized by the presence of LAMP 1 and absence of LAMP 2 lysosomal membrane protein markers as well as other endocytic tracer molecules. These cell biology studies clearly add to our understanding of M. paratuberculosis interactions with macrophages. This study has also provided a general description of early events in M. paratuberculosis infection of cultured macrophages. Several intracellular pathogens such as Chlamydia or Coxiella undergo readily distinguishable morphological changes during infection of host cells [31, 32]. This is clearly not the case for M. paratuberculosis or other mycobacteria as they remain morphologically similar at least up until 4 days postinfection. However, an increased percentage of degraded mycobacterial forms was observed over time. These degraded forms appeared by 24 hours postinfection and were hardly recognizable morphologically, but did label with immunogold particles indicating the presence of mycobacterial antigen. At low moi, the bacilli were tightly clustered into a single vacuole throughout the observed time period. This mycobacterial vacuole is most likely characteristic of a late endosome, based on previous studies with M. avium, M. tuberculosis[33, 34] and M. paratuberculosis. All intracellular bacterial pathogens enter host cells surrounded by a membrane bound vacuole [35, 36]. Some pathogens in heavily infected cells collect into a single vacuole within the same cell . J774 macrophages infected at a moi of 5:1 showed separate M. paratuberculosis-containing vacuoles within the same macrophage even after 48 hours postinfection (Figure 2). Likewise, M. tuberculosis and M. avium appear to remain in distinct phagosomes that do not harbor more than one bacilli per vacuole (see Figures 1A and 4B in  for example). However, in M. avium-infected macrophages, one of the first phenotypic alterations following activation with cytokines is the coalescence of individual M. avium-containing vacuoles into communal vacuoles with many bacilli . The significance of separate M. paratuberculosis-containing vacuoles observed in this study is still unclear. There appears to be a tenuous relationship to gain control between M. paratuberculosis and the macrophage with survival at stake. The macrophage can control growth and even kill M. paratuberculosis. However, the mycobacteria are cytotoxic to macrophages or induce apoptosis at high moi. The mechanism that enables M. paratuberculosis to persist within cattle for several years remains unclear as high moi are not likely observed at early stages of Johne's disease. In vitro assays to quantify survival of bacteria in macrophages provide useful insights into host-pathogen relations. The results of this study provides further insight surrounding M. paratuberculosis-macrophage infections and have implications in the pathogenesis of M. paratuberculosis, a pathogen known to persist inside cattle for many years. Further studies need to address the tenuous relationship between mycobacteria and macrophage in relation to disease outcome. M. paratuberculosis ATCC19698 was grown in Middlebrook 7H9 broth (pH 6.0) supplemented with oleic acid albumin dextrose complex (Becton Dickinson Microbiology) and 0.05% Tween 80 and ferric mycobactin J (2 mg/L). For viability counts, M. paratuberculosis was cultured on Herold's egg yolk medium (HEYM) prepared as described elsewhere . The murine macrophage cell line, J774.16, was cultured in Dulbecco's modified Eagle medium (MEM; Life Technologies) supplemented with 10% defined fetal calf serum (Hyclone Laboratories) at 37°C in 5% CO2. Because phagocytosis of mycobacteria was shown to be enhanced with complement protein C3 , macrophages were infected with M. paratuberculosis in the presence of 10% serum from a clinical cow with Johne's disease. Multiplicities of infection (moi) ranged between 2:1 and 30:1 (bacteria: macrophage ratio) in PBS. The number of macrophages was 3.0 × 106/well as determined on an Angel CellTrak 3B cell counter. The input inoculum was 3.0 × 107mycobacteria/well for a 10:1 moi experiment. After 2 hours, extracellular bacteria were removed by washing the monolayers twice with fresh media. Infected macrophages were then incubated in MEM at 37°C and in 5% CO2. Medium was exchanged every third day during the course of the infection. To determine survival of M. paratuberculosis within macrophages, 24-well plates of macrophages were infected at an moi of 10:1. Infected macrophages were lysed in cold sterile distilled H2O at 0, 24, 48, 72, 96, 120, 144, and 168 hours postinfection. Following lysis, serial platings of infected macrophage lysates on HEYM slants were performed. Lysates from three separate wells were plated for each time point. Colloidal gold-conjugated goat anti-rabbit IgG was purchased from Ted Pella, Inc., Redding, CA. Two New Zealand white rabbits were immunized with sonicated preparations of M. paratuberculosis as previously described . Antibodies directed at a whole cell sonicated extract of M. paratuberculosis were affinity purified using AminoLink columns (Pierce Chemical Company, Rockford, IL, USA). Briefly, the sonicated extract of M. paratuberculosis was coupled by reductive amination to a 4% agarose support column (Pierce Chemical Company). Sera from rabbits immunized with a killed preparation of M. paratuberculosis (1–2 ml) were passed over the column followed by three washes and elution according to the instructions of the manufacturer. Eluted fractions were evaluated by spectrophotometry and immunoblot analysis . Fractions with the highest absorbance at 280 nm and the strongest reactivity by immunoblot were neutralized in 1 M Tris-HCl (pH 9.5) buffer and stored at 4°C. All fixation and staining procedures were conducted at room temperature. Noninfected and M. paratuberculosis-infected macrophages were cultured on membrane inserts for times indicated in each experiment described below. Cells were fixed for 2–4 h in 2.5% glutaraldehyde in 0.1 M Cacodylate buffer, pH 7.4. Fixed cells were washed in the same buffer three times and were postfixed in 1% OsO4 in 0.1 M cacodylate buffer, pH 7.4, for 2 h. After washing in the same buffer, cells were incubated with 30% ethanol for 10 min. The cells were further dehydrated with a graded series of ethanol and embedded in epoxy resin (Embed 812). Ultrathin sections for immunoelectron microscopy were washed in buffer 15 min three times and etched with saturated sodium metaperiodate for 15 min. Cells were then blocked with 5% BSA for 30 min at room temperature. Cells were treated with affinity purified rabbit IgG against M. paratuberculosis (diluted 1:20) in the blocking solution for 2 h at room temperature. Cells were washed in Tris buffer containing 0.1% Tween 20 and 0.1% BSA four times for 10 min each and then incubated with goat anti-rabbit IgG conjugated to colloidal gold (10 nm diameter) in Tris buffer for 2 h. Immunolabeled sections were washed in Tris buffer four times and fixed with 1% glutaraldehyde in Tris for 10 min. All ultrathin sections were double stained with uranyl acetate and Reynolds lead citrate and then observed under a Philips 410 microscope. The expert technical assistance of Janis Hansen and Trudy Bosworth is appreciated. We gratefully acknowledge Judy Stasko for the embedding and staining of samples for electron microscopy.